Flight Planning simply means developing a flight plan based on clearly defined data needs. The screenshot above (click to enlarge) is a “UAV flight plan of the coastal section of Tacloban city, Leyte generated using APM Mission Planner. The [flight] plan involved flying a small UAV 200 meters above ground level. The raster scan pattern indicated by the yellow line was designed to take images with 80% overlap & 75% side overlap. The waypoints indicating a change in direction of the UAV are shown as green markers.” The purpose of the overlapping is to stitch and accurately geo-referenced the images during post-processing. A video on how to program UAV flight is available here. This video specifically focuses on post-disaster assessments in the Philippines. In terms of payloads (cameras), three different kinds were used: Panasonic Lumix LX3, Canon S100, and GoPro Hero 3. These cameras come with both advantages and disadvantages for aerial mapping. The LX3 has better image quality but the servo triggering the shutter would often fail. The S100 is GPS-enabled and does not require mechanical triggering. The Hero-3 was used for video reconnaissance specifically. Transforming aerial images into orthomosaics involves: (1) manually removing take-off/landing, burry & oblique images; (2) applying contrast enhancement to images that are either over- or under-exposed using commercial image-editing software; (3) geo-referencing the resulting images; (4) creating an orthomosaic from the geo-tagged images. The geo-referencing step is not needed if the images are already geo-referenced (i.e., have GPS coordinates, like those taken with the Cannon S100. “For non-georeferenced images, georeferencing is done by a custom Python script that generates a CSV file containing the mapping between images and GPS/IMU information. In this case, the images are not embedded with GPS coordinates.” The sample orthomosaic above uses 785 images taken during two UAV flights (click to enlarge). 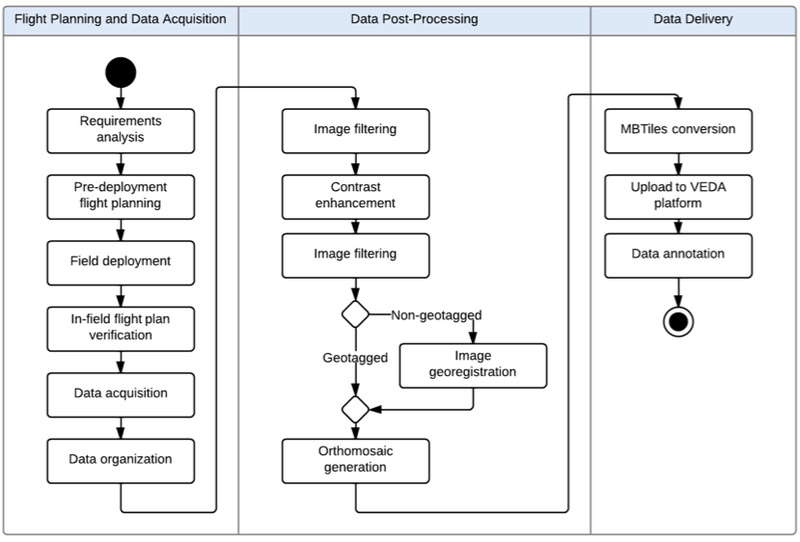 Data Delivery involves uploading the orthomosaics to a common, web-based platform that stakeholders can access. Orthomosaics “generally have large file sizes (e.g around 300MB for a 2 sq. km. render),” so the team created a web-based geographic information systems (GIS) to facilitate sharing of aerial maps. “The platform, named VEDA, allows viewing of rendered maps and adding metadata. The key advantage of using this platform is that the aerial imagery data is located in one place & can be accessed from any computer with a modern Internet browser. Before orthomosaics can be uploaded to the VEDA platform, they need to be converted into an approprate format supported by the platform. The current format used is MBTiles developed by Mapbox. The MBTiles format specifies how to partition a map image into smaller image tiles for web access. Once uploaded, the orthomosaic map can then be annotated with additional information, such as markers for points of interest.” The screenshot above (click to enlarge) shows the layout of a rendered orthomosaic in VEDA. “Similar techniques could also be used for crop damage assessment after a disaster such as Typhoon Haiyan, where for example standing coconut trees could be distinguished from fallen ones in order to determine capacity to produce coconut-based products.” This is an area that my team and I at QCRI are exploring in partnership with Matthew, Charles and company. In particular, we’re interested in assessing whether crowdsourcing can be used to facilitate the development of machine learning classifiers for image feature detection. More on this here, here and on CNN here. In addition, since “aerial imagery augmented with ground observations would provide a richer source of informa-tion than either one could provide alone,” we are also exploring the integration of social media data with aerial imagery (as described here). In conclusion, Matthew, Charles and team are looking to further develop the above framework by automating more processes, “such as image filtering and image contrast enhancement. Autonomous take-off & landing will be configured for the custom UAV in order to reduce the need for a skilled pilot. A catapult system will be created for the UAV to launch in areas with a small clearing and a parachute system will be added in order to reduce the risk of damage due to belly landings.” I very much look forward to following the team’s progress and to collaborating with them on imagery analysis for disaster response.